Why is search engine optimization (SEO) & search engine marketing (SEM) important and what is the difference between the two? It’s a question that we here at Six Demon Studio get asked a lot. The simplest answer is that SEO & SEM is the process by which a website or ecommerce site gains good position with search engines such as Google or Bing for a particular search phrase. Search engines drive the bulk of web traffic and without SEO & SEM your website sits on the dusty country road with little traffic. 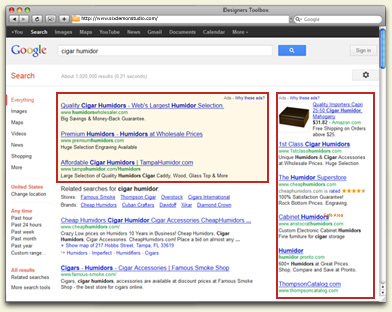 What is the difference between search engine optimization and search engine marketing? Search engine marketing (SEM) is also sometimes called organic search results. These are the results that Google & Bing display based a range of factors such as what phrases appear on your web pages, the number of other websites that link back to your page and the quality of those other sites (see below image for SEO results highlighted in red). All of these factors are calculated to determine how much of an authority your website is on that particular subject; the more authoritative the search engine believes you are the higher your ranking. Picture a room full of people at a social gather and off on one side of the room you are talking about an area that you’re knowledgeable on, let’s say cigars. You strike up a conversation with those around you talking about cigars and eventually other folks join in to hear what you have to say on the subject as you have established yourself as an authority on the subject. The word of your knowledge spreads across the room and reaches a point that when another person on the opposite side of the room asks the question “does anyone know anything about cigars?” instantly your name pops up as the person to talk to. While that is a simplistic and somewhat inaccurate example of SEO, it does give one the general idea. Search engine marketing (SEM) is also a method of getting Google and Bing to suggest your website as a place relevant to the phrase that the user was looking for (see below image for SEM results highlighted in red). However, rather than ranking your page based on the content of your page, SEM is based upon an ad that is placed for that search term and ranked upon the amount of money you’ve bid. This is also referred to as Pay Per Click (PPC) advertising. If SEO is a crowded room full of people talking, then SEM is a large banner hanging on the wall advertising your site as the place to find knowledge on a particular search term.